Today's blog comes from Heather Lewis a writer so amazing that, even as you read this blog, her words are being etched into stone for TV archaeologists to discover in the future! 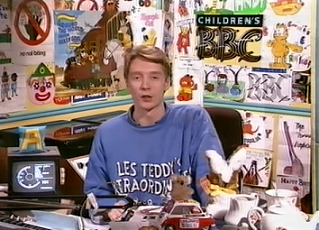 I’ll rewind back to 1989, it’s mid-morning and before introducing the pre-school show ‘Playbus’, Andy Crane is reading out birthday cards for (other people’s) lucky kids. I always kept my fingers and toes crossed that Andy would hold up a card with my photo on, even though it wasn’t my birthday! He reads out the birthday wishes with a huge amount of excitement, which always left me wondering if Andy was celebrating his own birthday too. 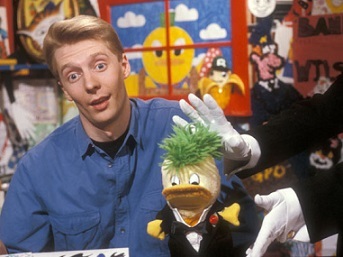 We move on to later that day, and by 1989 Andy’s afternoon Children’s BBC slot is immensely popular, the short in-vision links he presents often being more entertaining than some of the children’s shows themselves. Late in 1988 Andy was joined by a six year old showbiz duck named Edd and a butler called Wilson (remaining out of vision all bar his gloved hands). The final link in their ‘Broom Cupboard’ every weekday at 5:30pm (before Neighbours) was watched by over 15 million people and had now become a 3 minute comedy show in itself. Creating glorious chaos, Andy, Edd and Wilson danced, played instruments, attempted to cook, skateboarded and grew a tomato plant (called ‘Brian’). Dressed in his own jeans and sweatshirts Andy played the role of our daft teenage brother to perfection, making us laugh by unexpectedly breaking in to song, playing air guitar and getting into technical muddles with the control panel buttons. Hairspray jokes aside, Andy deserves to be remembered and celebrated for having the huge task of taking over the Broom Cupboard ‘swivelly’ chair from Phillip Schofield, Children’s BBC’s first and incredibly popular presenter back in 1987.